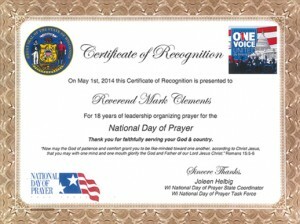 Certificate of Recognition presented to Reverend Mark Clements, for 18 years of leadership organizing prayer for the National Day of Prayer. In 1997, a group of ministers met with newly elected Mayor John Medinger for breakfast and a time of prayer for him as he began his tenure as Mayor of La Crosse, Wisconsin. The following year, and each year since, this event has expanded to include other elected officials from our area, state, and nation, and representatives from the educational, law enforcement, military, emergency response, and fire protection professions. Each year, the Mayors of La Crosse and Onalaska rotate as honorary host. This annual event, which coincides with the National Day of Prayer, is now open to the public and provides breakfast, a time of prayer, and a clear, reasoned presentation of the Gospel of Jesus Christ. In 2013 planning began to expand from a single annual event to an organization that would “Provide and Promote Prayer in the Coulee Region and beyond” 365 days a year, and thus, the Coulee Region Prayer Consortium was established.